Geilo is Norway's oldest Alpine Resort - the first ski lift was built in Geilo around 1920 and the resort has not looked back since! Situated at 800m above sea level on the edge of the Hardangervidda Geilo is the perfect resort for beginners, aspiring intermediates and families. An excellent snow record, new efficient lift system, well groomed pistes and best of all no ski queues at all even in February half term. Geilo is situated half way along the beautiful Oslo - Bergen railway line, to the south is the Hardangervidda - made famous by the Heroes of Telemark in World War 2; to the North is the high mountain plateau of Hallingskarvet. 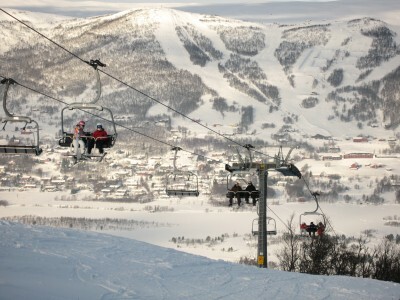 The ski area in Geilo opens in mid November and the season stretches all the way through to early May. The resort is blessed with constantly good snow. The actual resort by Alpine standards is quite small - it is extremely friendly with wonderful bakeries, some excellent ski shops, après ski pubs and pizza restaurants including Pepes which is now a Norwegian institution and 3 well stocked super markets. Like most Norwegian resorts Geilo is the perfect place to introduce beginners, especially children to the joys of skiing and snowboarding. The nursery area at Geilo Fjellandsby is perhaps the best one we have found in all our years of skiing - a moving 'magic carpet' wide open slope, poma lift, Iglu, warm cosy restaurant and a 4 man chair to graduate to. Once the chairlift has been mastered the wide open slopes of Geilolia beckon. On the Geilo side of the mountain Slaatta is also an excellent nursery area served by 2 drag tows and wide open nursery slopes. While Geilo isn't that big - 55 marked runs served by 26 lifts and around 45kms of prepared piste the area is varied enough to keep intermediate skiers entertained all week. Start over on Geilolia; the gentle blues to the right - practice carving on Route 66; take a few leaps in the Park just off route 52. The Trollheisen Chairlift opens up an FIS regulated race piste - a glorious wide sweeping red run. On the Geilo side take the Havsdalshovda T bar - the views over the Hallingskarvet are wonderful from the top. Down at Havsdalen there are a couple of cosy restaurants serving hot chocolate and waffles as well as a full menu of lunches. The runs down to Slaatta through the trees are quite demanding. The Korken T bar back into the main system is steep and care is needed on this. Route 26 from the highest Pepes Pizza Restaurant in Norway down to Geiloheisen will test the strength of your thighs! Moving across the system towards Fugleleiken the blues through the trees are wonderfully smooth. Try the black for some adrenaline off the left of Gullsteinhovda. One thing you will notice at Geilo is that while the vertical drop isn't very big you actually do more skiing than if you were in the Alps because you ski straight on the lift - no waiting or queuing! Advanced skiers will find some challenging runs in Geilo - Routes 58 and 55 on the Geiloloia side are narrow and steep while 59 is a race prepared piste which will test most - can you keep the carve turns going all the way down? Back over on the Geilo side; Route 11 offers some steep piste skiing as well as some off piste to the right as you ski down. Route 13 has a timed slalom course, while Route 23 back down to Geiloheisen is a wide but steep black. Piste 33 down to Slaatta gets surprisingly bumpy. There is some good off piste to the right of the Havsdalshovda T bar. However with a hire car you can explore the hidden treasure of Al - it's where the locals go on their day off - 2 T bars open up 800m vertical of magnificent terrain. Or another 20 minutes down the road is Hemsedal the second largest ski area in Norway. Geilo has three big air parks and the largest half pipe in Scandinavia! On the Geilo side the park is off piste 53 and has some massive kickers; as the piste becomes flatter the kickers are replaced by rails then at the bottom right by the main station and in front of the restaurant terrace a big air jump - leap off the kicker and land in the big air bag! On the Geilo side the largest half pipe in Scandinavia is on Piste 14 - the kickers and huge as well. Over near Havsdalen there is a 'beginners' - the term is used loosely (!) park with slightly smaller jumps allowing you to graduate to the nutty kickers at Fugeleiken or Kikutheisen. Breakfast skiing is available at Geiloheisen on a Wednesday from 9 February onwards. Breakfast skiing costs 200Nkr (which includes breakfast) and gives you two hours of freshly prepared but virtually empty pistes on the Geilo side of the ski area. Evening skiing is available on every day at some part of the ski area all season and varies from Geilolia, Geiloheisen, Havsdalen and Slaatta. Geilolia operate an excellent ski school from the base station at Geilolia, though for beginners the ski school at Geilo Fjellandsby is excellent, small classes one or two British instructors and all the other instructors speak English.